I’ve acquired an iPhone 6+, and a super Boston Marathon case for it. 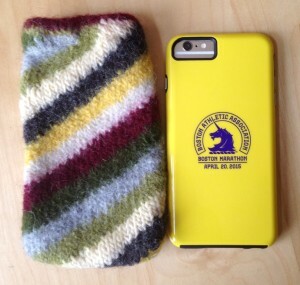 I like to keep my phone in a cozy for protection in my purse, so needed to make a new one. 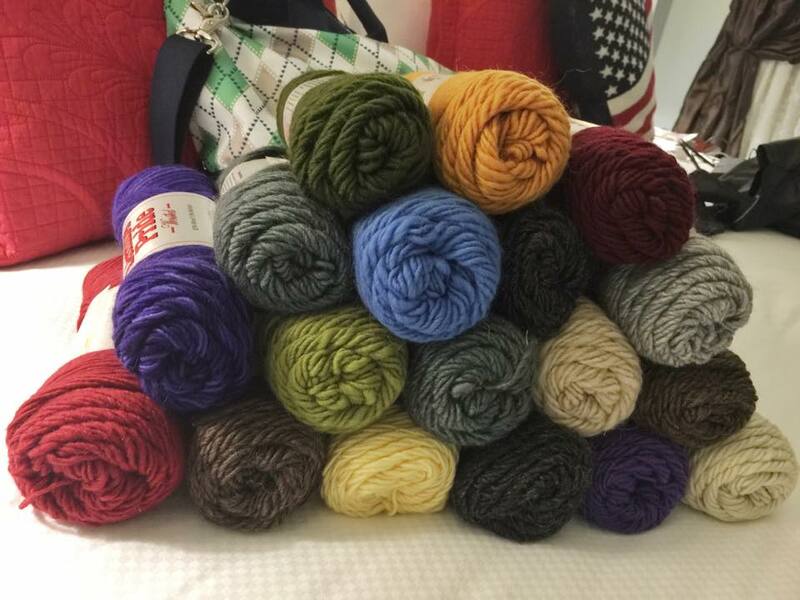 At Interweave YarnFest I replenished my stash of Lamb’s Pride worsted. Brown Sheep Lamb’s Pride Worsted – replenishing my stash! I’ve felted with this yarn before, so had my Yarn Gauge and felted gauges calculated and recorded. This saves so much time, and I do it for every yarn that I use for a project. You never know when you want to use that yarn again! 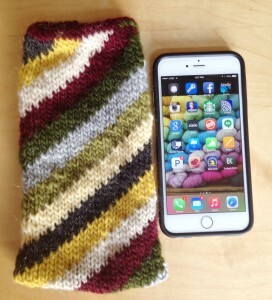 This is 40 sts, using a size 8US needle – 8 sections of 5 sts each, and every stripe is a different color. It is worked with Annetarsia ITR, and I moved the diagonal stripes every single row. If you have taken my class on Annetarsia “in-the-round” (ITR) you can make one of these. It was a fun, quick project. Here are photos of the cozy, pre-felted, and then after felting. The top edge is hemmed around a piece of 1/2″ elastic, which snugs the top around the phone, when it is inside. Felting is sometimes risky, if you want something to be a particular size. But knowing what the yarn has done in the past really increases your odds of success. My cozy turned out perfectly!